city is part of the Orlando metro area. The population of Oviedo is 26,316. Aulin. The area was incorporated as a city in 1925. 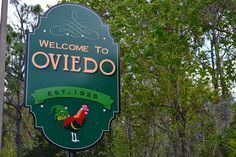 The City of Oviedo, Florida has a sister city...Oviedo, Spain. established in the 8th century. Seminole Trail which is heavily vegetated and great for long walks. The city is served by the University of Central Florida.